LTU Professor CJ Chung started Robofest in 2000. This year it has attracted more than 1,600 students from eight states (Michigan, Ohio, Texas, Minnesota, Florida, Hawaii, California and Louisiana) and five other countries (Canada, Mexico, Korea, China and India). 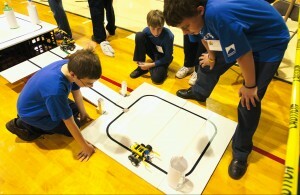 “To earn the right to compete in the Michigan championship round is not easy. These teams had to win in the 12 qualifying competitions we held in the state,” Chung said. Teams competing in the Robofest Michigan Regional Championship are from Adrian, Ann Arbor, Auburn Hills, Battle Creek, Berkley, Bloomfield Hills, Canton, Cedar Springs, Clawson, Dearborn, Detroit, Farmington Hills, Ida, Livonia, Macomb Township, Northville, Port Huron, Riley Center, Rochester Hills, Royal Oak, St. Clair, Sterling Heights, Superior Township, Troy, Waterford, Westland, Whitmore Lake and Ypsilanti. This year’s game mission, SRCC (search, rescue, cleanup, and collect data) is to search for and rescue people trapped in a black box from a tower, clean up white toxic boxes from the contaminated area, and measure the size of the contaminated area in square millimeters.